In renovating her small bathroom in Austria, Katharina Reckendorfer repurposed what she could—like a fold-up "Murphy bathtub" and vanity—and streamlined the rest. The new cement tile is from Mosaic del Sur. In a Los Angeles bathroom renovation, architect Barbara Bestor added a striped floor of Santander Granada tile, Douglas fir cladding, and Granada Serengeti tile flipped to create a one-of-a-kind pattern on the wall. The vanity countertop is Corian's Glacier White. The sconces are Glo-Ball designs by Jasper Morrison for Flos. The master bathroom of Ian Hague's Hudson Valley retreat combines cement floor tiles by Mosaic House; glazed subway tiles from Daltile; and honed, vein-cut Montclair Danby marble. The Signature Hardware tub sits in a custom wood cradle designed to match the home’s timber frame; the fixtures are by Waterworks. The Twist stool is from Classic Country in nearby Hudson, New York. Brooklyn–based graphic designers Jeanette and Mike Abbink worked with Architecture + Construction to renovate their Brooklyn residence. In the bathroom, the gray Carrara walls are offset by bright tulip-patterned wallpaper, circa 1970, from Secondhand Rose in Tribeca. The toilet is a Philippe Starck “jet action” model from Duravit. Mike Shively, the owner and architect of this renovated Chicago home, describes himself as “big on graphics” and designed these tiles, produced by Original Mission Tile in San Luis, Mexico, to add his own flair to the master bathroom. 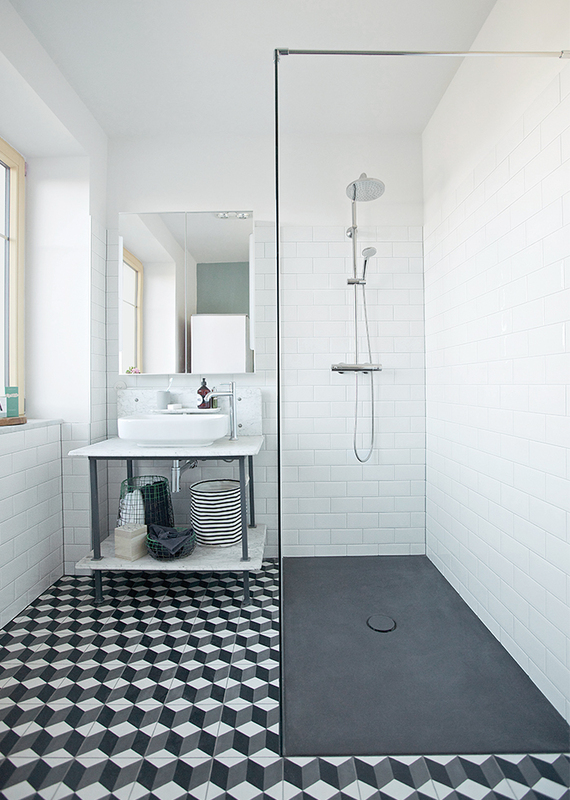 A simple floating vanity and minimalist shower let the custom tilework take center stage.